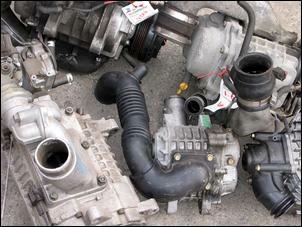 A look at the second-hand superchargers on the market. Run out of bolt-on mods to throw at your car’s atmo engine? Want more but not sure what approach to take? Well check out the option of adding a second-hand OE supercharger. Well, a good used blower will set you back as little as AUD$195 and they can typically boost an engine to around 14 psi without any reliability issues. Supercharger installation can be also pretty straight-forward in comparison to a turbo conversion. There’s no need to fabricate heavy-duty exhaust manifold(s), oil and water feed and return lines and no need to modify the front section of exhaust. All you need is a custom mounting bracket with an idler and a new belt. Oh, and a re-routed induction system and accompanying ECU mods. This supercharger is, in a word, tiny. Fitted to upmarket versions of the Japanese-market Subaru Vivio/Pleo, this blower is lightweight and can be squeezed in very tight engine bays. It measures approximately 18.5cm in length (including the pulley) and the main body is around 15cm wide and 10.5cm tall. 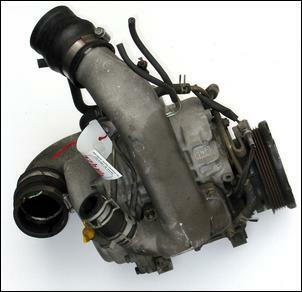 Although fitted by Subaru, the blower is manufactured by Aisin and is coded AMR300. This code suggests it displaces 300cc of induction air per revolution. The 660cc supercharged Vivio engine is rated at the class regulation 47kW and has 84Nm of torque, so the AMR300 blower is suitable for only low power applications. This makes sense when you look at the small 45mm OD blower outlet pipe. We’d be reluctant to push the AMR300 supercharger past 70kW - which means it’s good for only sub 1.0-litre engines. 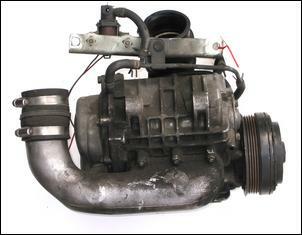 This is another small capacity supercharger manufactured by Aisin for Nissan Motor Company. Coded AMR500 (a step up from the Subaru’s AMR300) this is another light and compact supercharger. This unit measures 17cm long, 18cm wide and 13cm tall (not including the mounts and bolt-on inlet and outlet pipes). Again, the outlet pipes measures just 45mm OD but its code suggests that it displaces 500cc per revolution. The AMR500 blower is used on a very interesting engine. The Japanese-market Nissan March from the early ‘90s could be optioned with a MA09 1.0-litre 4-cylinder that boasts a supercharger and turbocharger! Peak power in factory form is 81kW, along with 130Nm of torque. This supercharger can be used for slightly higher power applications than the Subaru’s AMR300. We suggest that about 110kW is its limit. 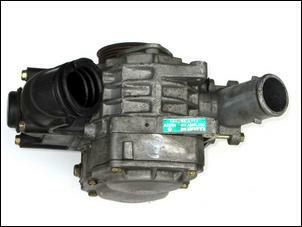 The Toyota4A-GZE supercharger is the most popular second-hand supercharger in Australia. This unit is a considerable step up in weight and size over the previous Aisin superchargers. Coded SC12, the 4A-GZE blower is 27cm long, 21cm wide and 15cm tall (not including mounts or bolt-ons). 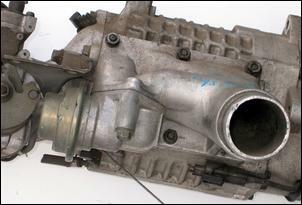 The extra breathing potential of this supercharger can be seen in its larger outlet pipe, which measures 57mm OD. We’re led to believe that this supercharger displaces 1200cc per revolution and, in standard form, boosts to around 10 psi. In its final years of production, the supercharged and air-to-air intercooled 1.6-litre 4A-GZE engine had a standard output of 125kW and 206Nm. In tuning circles, we have seen this blower in applications making over 150kW with good reliability. 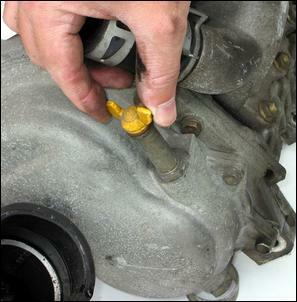 Note, however, boost pressure in excess of 14 psi can lead to heat-related supercharger failure. Interestingly, the 4A-GZE blower comes with a small dipstick to check the internal oil level. It also has an electro-magnetic clutch mechanism (much like an air-con compressor clutch) that is used to engage and disengage drive to the supercharger. 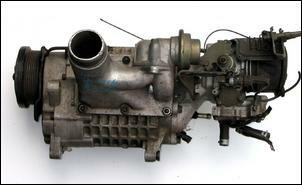 The supercharger fitted to the 1G 2.0-litre straight-six is essentially a larger capacity version of the 4A-GZE’s SC12. Coded SC14, the 1G-GZE blower is the same width and height as the SC12 unit except it is 31cm long overall. The other major difference is the lack of an oil dipstick – the SC14 uses a conventional oil level inspection/filler plug. With the same 57mm OD outlet pipe but displacing 1420cc per revolution (220cc more than the 4A-GZE supercharger), the SC14 is fitted to the Japanese-market Toyota Crown, Chaser and several other models. Unlike the 4A-GZE, the supercharged 1G-GZE wasn’t equipped with an intercooler – this helps explain why it makes the same 125kW peak output as its little cousin. This is a better supercharger to pick if you want a little more power than the SC12 can provide – we guess that around 170kW would be a safe limit. Here’s a relatively uncommon supercharger. 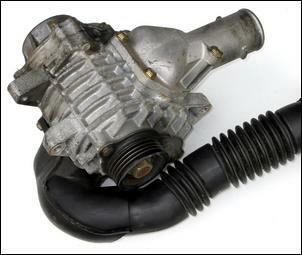 In 1987, Mitsubishi Japan released a supercharged version of the 6G71 2.0-litre SOHC V6 to the local market. Fitted as an option in the Debonair luxury saloon, the supercharged 6G71 uses a Mikuni labelled supercharger and water-to-air intercooler to deliver 110kW and 221Nm of torque. The 6G71’s blower unit is an intriguing one. 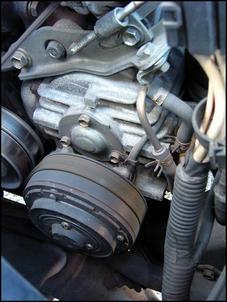 Unlike most supercharged engines with a V-configuration, the Mitsi blower is mounted off the front cylinder bank of the transverse V6. The rear of the supercharger also connects to an aluminium snout that incorporates the throttle body. 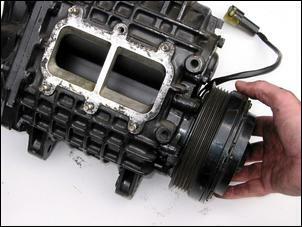 A supercharger bypass valve is also fitted (see pic). 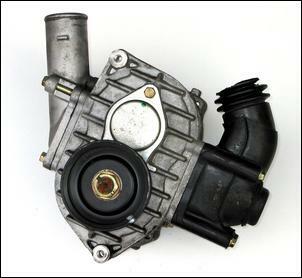 Blower body dimensions are 29cm x 19.5cm x 14cm. This is a rare blower and, given it is fitted to a mild 2.0-litre 110kW engine, we’d be reluctant to push it past about 150kW. The above superchargers were photographed at Adelaide Japanese Dismantlers. Bob Dunn from AJD tells us the small superchargers (Subaru and Nissan ones) typically sell for AUD$195 and the bigger units go for AUD$350. We’re told that these import superchargers have been fitted to everything from motorbikes, to hot fours, Commodore sixes and even V8s (in a twin supercharger arrangement)! When inspecting a second-hand supercharger, you should be able to grab the front pulley and spin the entire lobe assembly with relatively little effort. If it’s not smooth in rotation you‘d be advised to move onto the next one. Note that very few superchargers seize – if they do it’s usually because they’ve swallowed glass and various other debris during importing. Adelaide Japanese Dismantlers have sold countless second-hand superchargers and claim that only one has been returned due to failure – and we’re told it was being used at over 20 psi in a drag racing Mazda rotary... Reliability shouldn’t be a problem so long as you always use an air filter and don’t overspeed the blower in the quest for more boost! Stay tuned for Part Two of Supercharger Steal – we’ll look beyond Japanese-import blowers!